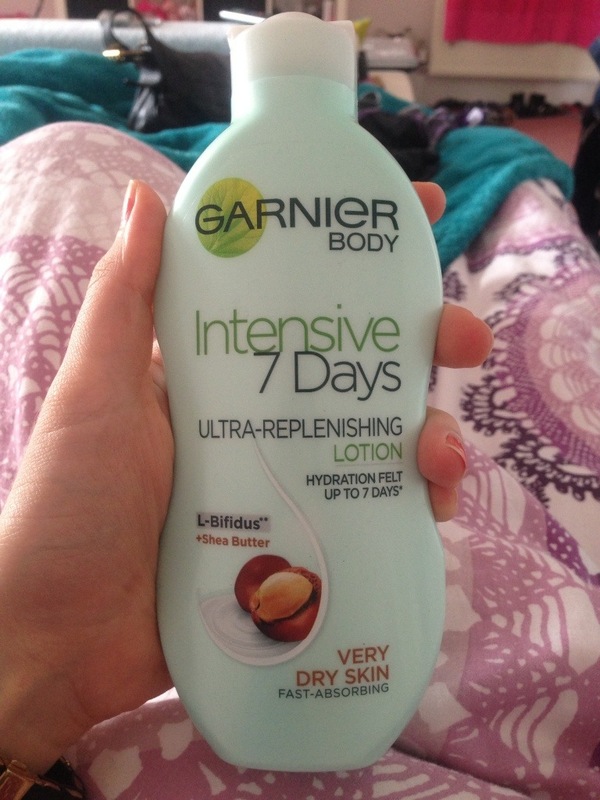 Just In: Garnier Body Intensive 7 Days Ultra-Replenishing Lotion in Shea Butter | Becky Alyssa's Beauty Box. After a horrible weekend of being ill, I was called into the hospital on Sunday evening – that’s when you know it’s serious! Luckily I was just prescribed antibiotics and should be feeling fine within a week or so. However the antibiotics are making me feel dizzy, nauseous and just plain horrible. So I wanted to buy something to take my mind off of it while I’m sat in bed feeling rotten! Currently on sale for a reasonable £2.09 at Boots, I’ve been seeing this body lotion popping up all over my favourite beauty blogs lately. As much as I don’t really need another body lotion, I wanted to see if this was any better than my Palmer’s cocoa butter for dry arms and legs. I haven’t actually used any Garnier products in years so this is brand new to me. And the claim to hydrate up to 7 days seems a little bold, but we’ll see about that! First impressions: it smells gorgeous! I normally pick cocoa butter products over shea butter, but this is a refreshing change. Testing it on my arm, the formula is pleasantly light and non-greasy, leaving behind a lovely subtle scent and soft skin. I’m looking forward to trying this out after showering – my arms and legs seem to be constantly dry & hopefully this will help! Anyone tried this out already? Would you try this product? & any tips on how to NOT feel rubbish during a course of horrible antibiotics? !